WASHINGTON - Interior Secretary Ryan Zinke’s approach to his wife’s travel and activities sparked concerns among the department’s ethics officials, according to a report issued Thursday by Interior’s inspector general office. Zinke confirmed to investigators that he had directed his staff to research the possibility of giving his wife a volunteer job at Interior, a move that one ethics official objected to on the grounds that it was designed so that Zinke wouldn't "have to pay" for his wife's travel. Zinke subsequently "denied that it was an effort to circumvent the requirement to reimburse the DOI for her travel," the report states. The new findings came after a chaotic week at the Department of Interior. Hours before the report was released, Interior Department officials said that they did not approve the hiring of a political appointee as their agency's acting watchdog, calling the announcement of her move by Housing and Urban Development Secretary Ben Carson "100 percent false information." The backtracking on Suzanne Israel Tufts' move drew widespread scrutiny, raising questions about how and why she was supposedly chosen to lead Interior’s inspector general’s office, which is conducting at least four investigations into Zinke’s activities. Last week, investigators issued two subpoenas for documents to entities tied to the probes, according to two individuals familiar with the matter who spoke on the condition of anonymity because they were not authorized to speak publicly. "The Inspector General report proves what we have known all along: the secretary follows all relevant laws and regulations and that all of his travel was reviewed and approved by career ethics officials and solicitors prior to travel," she said in an email. Swift added that previous secretaries had received "the same exact legal advice" from the solicitor's office and that the department's motor vehicle policy "has been updated to reflect the reality of the long standing situation." "This report shows Secretary Zinke's dogged determination to use his office for personal gain, even going so far as to tell Interior's top lawyer to lie to the public to justify his wife's travel," said Jen Rokala, executive director of the Center for Western Priorities, an advocacy group. "Secretary Zinke owes the American people an apology - and a refund." Rep. Raúl Grijalva, Ariz., the top Democrat on the House Natural Resources Committee, said in a statement: "Republicans have known about Secretary Zinke's scandals for eighteen months and done nothing. Putting Democrats in charge of Congress is the only way to stop these abuses." The IG inquiry also found that the secretary had invited two individuals who had hosted a fundraiser for him when he served as a congressman to go on an official trip to California's Channel Islands, at government expense, and had not notified Interior lawyers about the fact that they were former political contributors. Top White House officials said Thursday that they had not been made aware of the plan to move Tufts to serve as acting inspector general at Interior. She is a lawyer from Queens who worked on President Donald Trump's campaign and has served as HUD's assistant secretary for administration since December. "Ms. Tufts is not employed by the Department and no decision was ever made to move her to Interior," Swift said in a statement Thursday. And in a striking public rebuke of another Cabinet agency led by a close friend of Zinke's, Swift wrote that HUD "sent out an email that had 100 percent false information in it." She affirmed that Deputy Inspector General Mary Kendall, who has led the office for nine years, is still in the job. In an email Friday with the subject line "A Fond Farewell," Carson wrote to HUD staffers: "It is with mixed emotions that I announce that Suzanne Israel Tufts, our Assistant Secretary for Administration, has decided to leave HUD to become Acting Inspector General at the Department of Interior." "I am extremely grateful to Suzanne for her service to HUD and am confident that she will thrive in her new role," Carson added. Swift said Tufts was referred to Interior officials by the White House "as a potential candidate" for a position in the inspector general's office. Swift did not say what position. "At the end of the day, she was not offered a job at Interior." The about-face came after mounting criticism by lawmakers on Capitol Hill and watchdog groups of what appeared to be an unorthodox arrangement between the agencies to bring in a political appointee to oversee Kendall. President Barack Obama nominated Kendall for the position of inspector general, but the Senate never voted on it. Tufts, meanwhile, is a former consultant who has no experience as an investigator and would have been leading one of the government's most active inspector general offices. 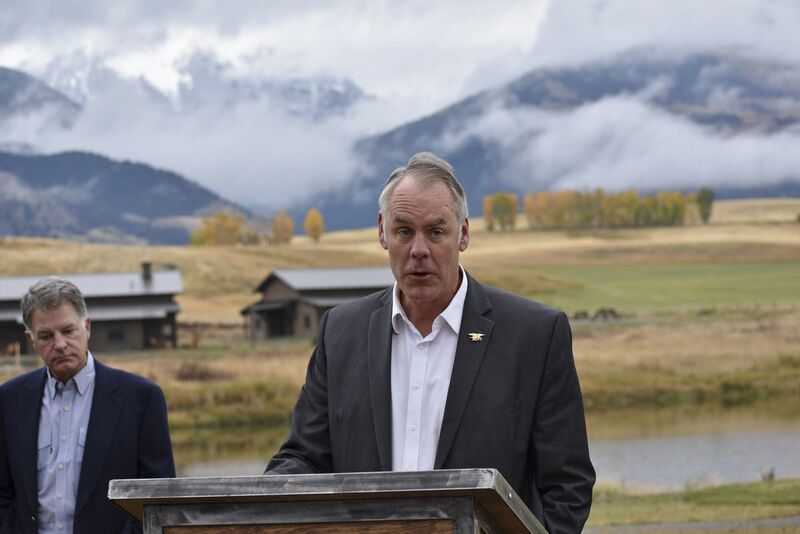 Kendall is conducting at least four investigations of Zinke's conduct, including his involvement in a Montana land deal and his activities in connection with two Connecticut tribes' application to open a casino. "Mary would agree that it would be good for the inspector general to be a presidentially appointed, Senate-confirmed individual," Bernhardt said. "I think she would agree with us that the job has been vacant since [former Inspector General Earl] Devaney left, for almost a decade. That's not good, because that's not the way we run the country." Tufts' appointment, which Carson announced to HUD staff last Friday, came to light this week through reports in The Washington Post and other outlets. White House officials, speaking on the condition of anonymity to discuss personnel matters, said the move was a surprise to them. Interior officials declined until Thursday to answer questions on Tufts' hiring, saying instead that the post has been vacant for almost a decade and that any announcement on a Senate nomination would come from the White House. While presidents have the right to hire and fire inspectors general, the Inspector General Act of 1978 specifies that candidates should be chosen "without regard to political affiliation and solely on the basis of integrity and demonstrated ability in accounting, auditing, financial analysis, law, management analysis, public administration, or investigations." Michael Bromwich, who served as inspector general at the Justice Department from 1994 to 1999 as well as head of Interior's Bureau of Ocean Energy Management from 2010 to 2011, called the move to hire Tufts "highly unusual." "The statute says that alone among political appointees, this is a nonpartisan position to be staffed on a permanent basis by those with appropriate backgrounds," Bromwich said. "It's a real breach of protocol to put someone who's only qualification is political allegiance to the Trump administration." The Washington Post’s Tracy Jan and Robert O’Harrow contributed to this report.